Don't you hate tying your kids' shoes everyday before they step out of the house? Or what about those shoe laces that seem to come untied, not matter HOW you tie them. Wouldn't it be nice to just slip on your favorite pair of shoes, without worrying about tying them...EVER! I found that these HICKIES Never Tie Laces were the perfect accessory to my pair of shoes. I can easily slip my shoes off and on, without worrying about tying and untying and without stepping on untied shoe laces! My shoes stayed on and did not even try to come off of my feet, which is a big plus for me! These HICKIES Never Tie Shoe Laces were easy to install and only took less than 5 minutes. 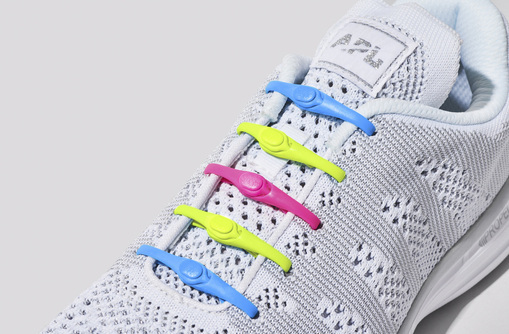 These are perfect for toddlers, as well, as they will not be able to untie their shoes and tripping over untied shoe laces will no longer be an issue. ***I received a complimentary product, in exchange, for my honest and unbiased review. REGARDLESS...all opinions expressed are 100% my own.